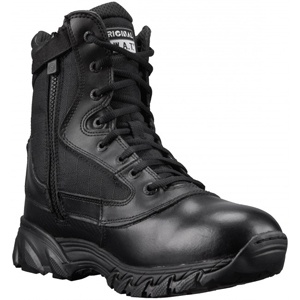 The Original SWAT Chase 9in Side-Zip Boot 131201 was engineered to perform for SWAT, law enforcement, and security professionals. This boot features a 100% full grain smooth leather and a 1200 ballistic nylon upper for improved durability and comfort. This premium boot was designed to perform under the harshest conditions while keeping you looking good. A polishable leather upper keeps you looking sharp at all times. With its proven non-slip Chase outsole and convenient side zipper, you can depend on this tactical boot to keep your feet dry and comfortable so you can focus on the mission. At a lightweight 44oz per pair, you won't have to worry about bulky boots slowing you down. Original Footwear included several technology measures to maximize comfort. They include a custom-molded thermoplastic heel counter and toe box for instant comfort and lateral support. A Texon stability platform and Poron performance cushioning pads to absorb shock. This boot has an airport friendly nylon shank for foot support and is safe for use around x-ray equipment.